The USA Pan nonstick bake able extra large sheet pan and non-stick extra large sheet cooling rack set includes a 20.25 x 14.25 x 1 inches extra large sheet pan and a 19.75 x 13.625 X0.056 inches extra large sheet cooling rack. This kitchen baking combo is the perfect set for home bakers looking for a larger pan surface to maximize the amount of baked items you can cook at the same time. With this set, you'll enjoy freshly baked cookies, cakes, and scones that bake evenly, cool uniformly, and come out tasting great. The USA Pan non-stick extra large sheet cooling rack fits seamlessly inside the USA Pan non stick extra large sheet pan and provides home bakers with an easy way to add the perfect glaze or finish to your homemade baked goods. Simply place your oven safe cooling rack in the pan, add your items on top of the cooling rack, and you are ready to start baking like a professional. The nonstick coating on both the extra large sheet and the cooling rack means that your baked goods will release quickly and easily, leaving your cookie bottoms crispy and intact! both the extra large sheet and the cooling rack are oven safe up to 450 degrees Fahrenheit. Hand washing is the preferred method of cleaning the extra large sheet pan. 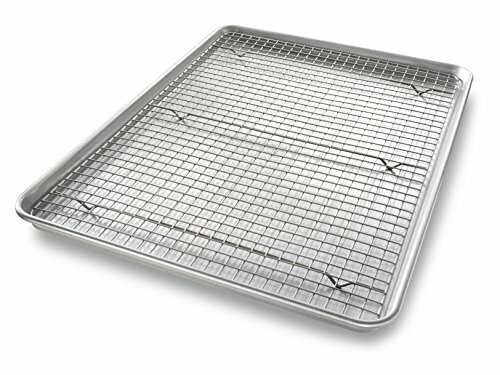 The cooling rack is not dishwasher safe and it is recommended that you clean the rack using a soft sponge or kitchen brush to remove food particles. USA Pan professional grade bakeware helps everyday home bakers produce professional grade baked goods. USA Pan bakeware is long-lasting, durable, reliable, and comes with a limited lifetime warranty. USA Pan is a Bundy family owned company, based in the greater Pittsburgh, Pennsylvania area that has been producing high performance bakeware for over 50 years. Dimensions represent baking surface, not Overall pan size. Baking pan made in USA. If you have any questions about this product by USA Pan, contact us by completing and submitting the form below. If you are looking for a specif part number, please include it with your message.